One of the best things about living in Dubai is the easy access to cuisines of the world, but up until now the city’s Uzbek offerings have been slim pickings. 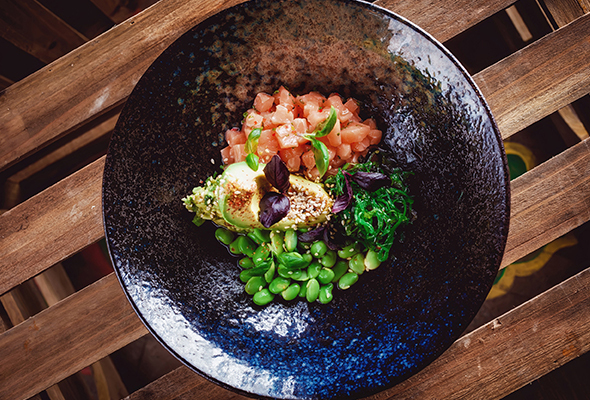 Osh is here to change that, putting the flavours of Uzbekistan and Central Asia firmly in the spotlight. Located in the licensed pocket of North La Mer, this is the second Osh outpost, with the original situated in chichi Knightsbridge, London. That high-end pedigree is evident in the sleek styling of the two-storey space. 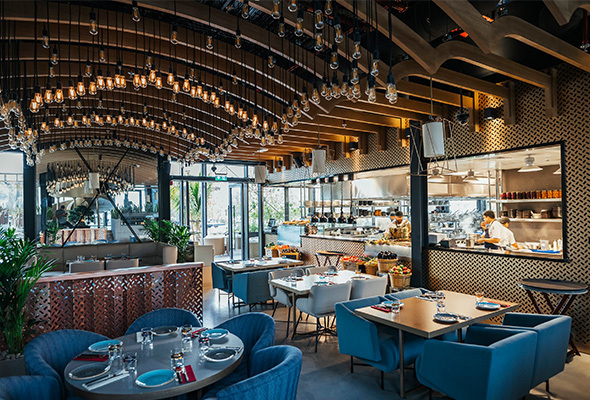 On the ground floor, you’ll pass an open kitchen with displays of shaslik, seafood and fresh vegetables, through a dining room filled with turquoise armchairs and hundreds of dangling Edison globes. If it looks empty, don’t be discouraged. Return guests know that the prime positions are at the top of the spiral staircase. 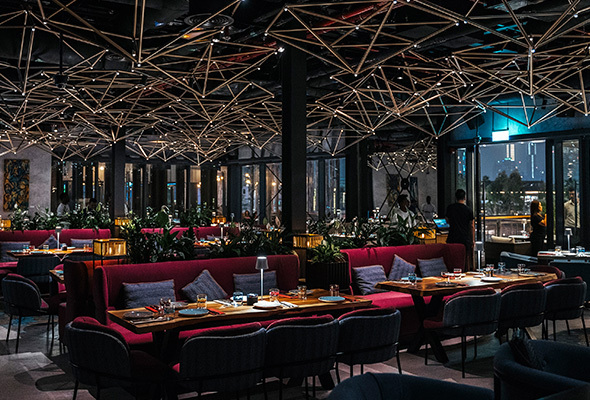 Here, a second dining space lined with intricate carpets, vivid pops of cerise and aqua, and a zig-zagging light installation gives way to a massive terrace, where groups snack and sip cocktails while soaking up views of La Mer. For those unfamiliar with Uzbek and Central Asian cuisine, it’s worth whipping out your atlas for a touch of perspective. Situated on the old Silk Road, this is where the Middle East meets Asia, a region shaped by centuries of trade and conquest. 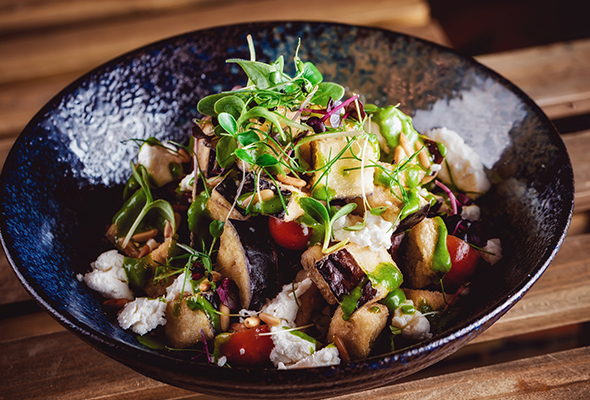 The kitchen delivers a modern interpretation of the grilled meats, manti, soups and salads of the region, with some deviations to the Far East and South America by way of tempura and ceviche. But where Osh excels on our visit is in the earthy, honest flavours of Central Asia. Fist-sized samsa (Dhs25) resemble a Central Asian-Cornish pasty with a filling of braised lamb and sweet onions. A zesty Georgian salad (Dhs38) combines handfuls of dill and parsley with cucumber, tomato, pomegranate, chilli and a fine dusting of grated walnut. 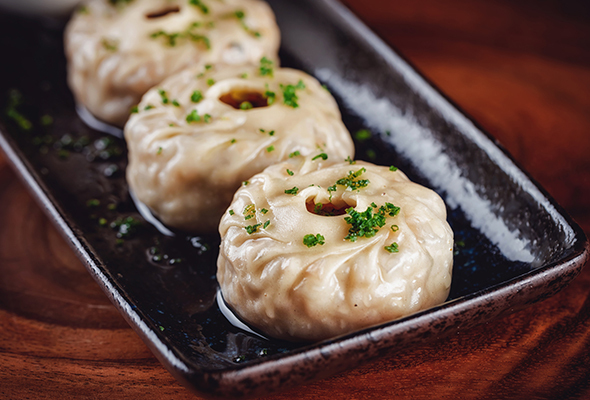 The steamed-to-order pumpkin manti (Dhs39) may take up to 30 minutes to prepare, but your wait is rewarded with a trio of plump, hearty dumplings filled with finely diced pumpkin, a lick of lamb stock, and dollops of sour cream to slice through the richness. For mains, there’s a Japanese-leaning caramelised black cod (Dhs170) with sweet potato puree and nutty spears of broccolini, and the standout lamb shashlik (Dhs115), two skewers of butter-soft meat served with pickled cucumber, shaved onion, and a garnish of chilli rings and pomegranate seeds. Desserts take a detour to France with the napoleon (Dhs45), a huge slab of flaky pastry, whipped cream and raspberry sauce that’s more than enough for two. Authentically Uzbek? Perhaps not, but when it tastes this good, we’ll allow them to take their liberty.